I am an amateur photographer. I love taking pictures of almost everything and anything. You will find me with a camera all the time. As I mentioned earlier, I am not a professional, I only have a Panasonic Lumix DMC-FX9 and some of my pictures don't always come out well. But I am learning and I even upgraded my Flickr site to a pro account by paying $24.95 per year. I have always allowed free access to all my images and licensed under a Attribution-NonCommercial-ShareAlike Creative Commons license. However, I discovered that several people have been using my images for commercial purposes. I found this out through the "Google alerts" service. Not that I really mind the pics being used for commercial purposes but I would have appreciated it if they had attributed the pics to me or at least asked me for my permission before using them. Some companies did ask me for permission but a lot of people didn't. In the end I decided to put "All rights reserved ©" on all my photographs. Now, only I can print photos and only friends and/or family can download them from my account. If anyone else is interested in using my pictures for any commercial purposes, I would have to charge them for it. 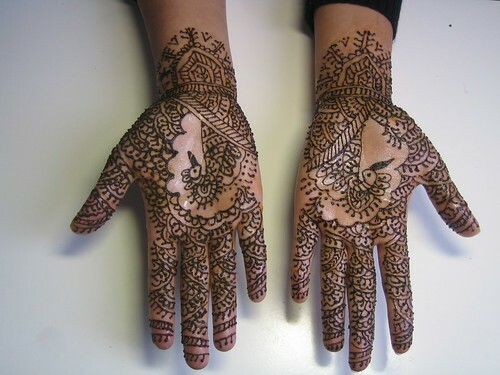 A picture of my sister's hands covered with henna before her wedding. The picture is really good. It is the most common problem of net that ppl get things of others and use it for personal benefit. Don't know when the rule to control of such thing will come. What a good picture!I am also interested in photography.This side is now have a great opportunity. yeah, totally agree..some of the things posted in the net should be copyrighted in order to prevent unwanted things..